Fill Out Forms from Home! Matossian Eye Associates now offers you the ability to fill out our forms from home to speed up your check-in process at the time of your visit. You can visit our newly designed patient portal at www.matossianeye.com to set up your account. This is a free, secure option to access information from your doctor while in the comfort of your home or office. • Select "Fill Out Forms" and create a secure account. Reading a menu or near work has become increasingly difficult – As the eye ages the lens becomes less flexible, making it harder to read at close range or do near work. This condition is called presbyopia, which comes from the Greek word meaning “aging eye.” Nearly all adults experience presbyopia starting around age 40. The most common treatment is simply to use over the counter reading glasses. Eyes suddenly burn or sting and water excessively – Dry eye is very common as people age, especially in women undergoing hormonal changes. For most people, treatment for dry eye is as simple as using over-the-counter eye drops. If these do not provide relief, an ophthalmologist may prescribe medication or suggest alternate treatment options. Seeing floaters or occasional flashes of light – Floaters are actually tiny clumps of cells floating in the clear gel-like fluid inside the eye. The flashes of light are caused by the gel pulling at the retina as it moves. Floaters and flashes become more common as one ages, but a sudden increase could be a sign of a torn retina. An emergency visit to the ophthalmologist is recommended to rule out a torn or detached retina. Colors are muted, lights appear to have halos – This can be a sign of cataracts, a clouding of the eye’s lens that nearly everyone develops as they age. Treatment for cataracts is usually surgery, which is one of the most common elective surgeries performed in the United States. The main purpose for cataract surgery is to improve vision and to allow patients to continue with their daily activities such as driving, working, and sports. Central vision seems hazy, making it difficult to recognize faces – This is a common symptom of age-related macular degeneration (AMD). Because symptoms usually aren’t noticeable until vision loss has already occurred, regular eye exams are essential to help diagnose AMD early. Trouble seeing at intersections while driving – Deteriorating peripheral vision may be a sign of glaucoma, a leading cause of irreversible blindness. Vision loss is so gradual that people affected by the condition are often unaware of it until their sight becomes compromised. Fortunately, most vision loss from glaucoma can be prevented with early detection and medical intervention, emphasizing the importance of seeing an ophthalmologist regularly. Eyelash extensions and embellishments have become very popular today with celebrities like Nicki Minaj and the Kardashians endorsing these eyelash enhancements. However, these lash trends come with some pretty big dangers as well. Eyelash extensions are achieved by having single synthetic fibers glued one by one onto natural eyelashes. The fibers are usually glued into place by formaldehyde-based adhesives or other biologic glues. These adhesives can cause allergic reactions, as can the solvents used to remove them. In addition, lash extensions carry a risk of bacterial and fungal infection. The extensions can also cause irritation to the conjunctiva (conjunctivitis) or cornea (keratitis). Another of the latest trends is eyelash embellishment, or ‘eyelash-bling.’ One type involves threading tiny glass beads onto ultra-thin copper or silver wire that is bent to conform to the shape of your eye and applied with an adhesive directly above the eyelashes. 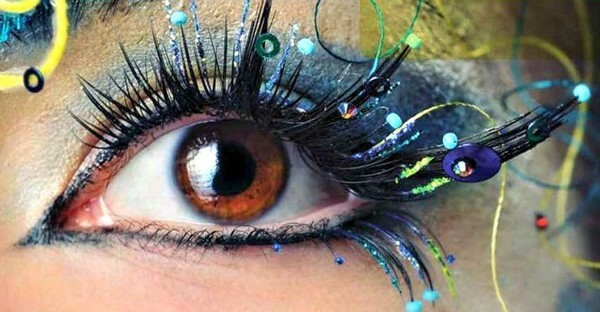 Another type involves gluing crystals onto eyelash extensions. Having these sharp objects near your eye can lead to ocular scratches, infections, and irritation. Matossian Eye Associates advises our patients to stick to using mascara, and to use it safely! Never share mascara, and replace your tube every three months. Also, be sure to remove your eye makeup before you go to sleep. 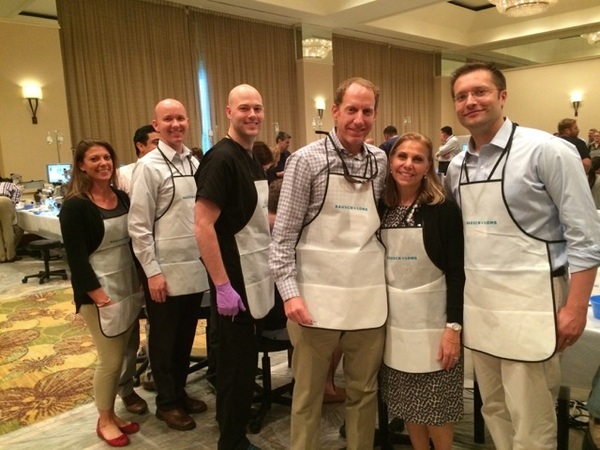 Twice a year, Cynthia Matossian, MD, FACS of Matossian Eye Associates participates as a featured faculty member at the weekend-long surgical mentor resident program sponsored by Bausch + Lomb for surgical residents and their attendings from academic programs all over the U.S. 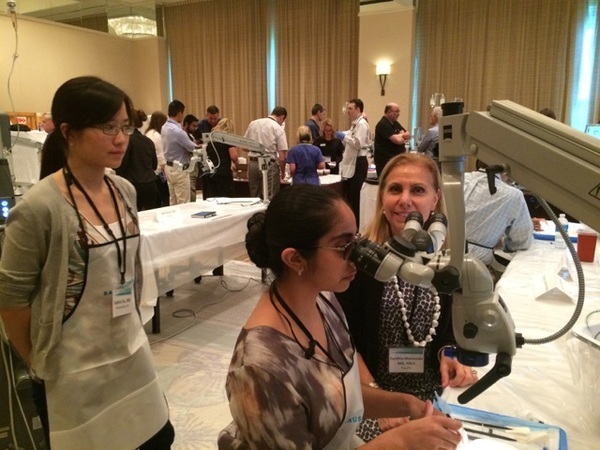 This event is designed to teach cataract surgery techniques through hands-on experience in a wet lab setting in Tampa, Florida. In August, Sebastian Lesniak, MD, Matossian Eye Associates' cornea specialist, joined Dr. Matossian. In the picture below, Dr. Matossian teaches cataract surgery techniques to ophthalmology residents from Temple University, Philadelphia. In the picture below, Dr. Matossian is pictured between Robert Weinstock, MD of Florida (left) and Dr. Lesniak (right), along with a group of residents and B+L representatives. 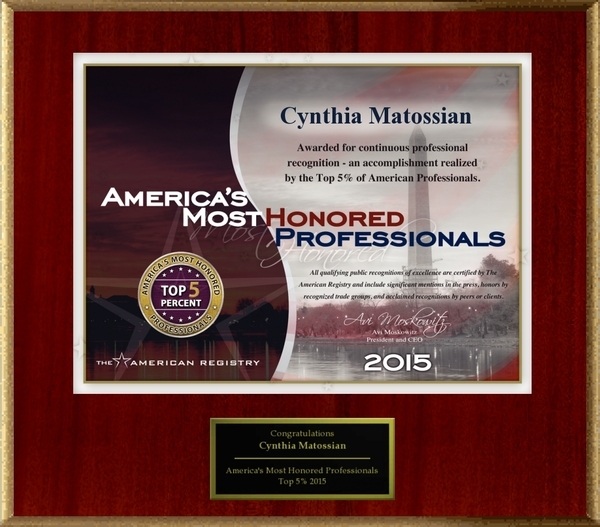 American Registry has selected Cynthia Matossian, MD, FACS as one of America's Most Honored Professionals. The honorees selected for this award comprise high achieving professionals in every industry in America. Honorees must have been continuously recognized for professional excellence throughout the last five years. Each acknowledgement is carefully considered by a group of researchers who specialize in award evaluation. This award is an accomplishment realized by the top five percent of American professionals. Regular eyelash and eyelid skin cleansing is important for people with eye conditions like blepharitis, ocular rosacea, dry eye, conjunctivitis, and other eye disorders. 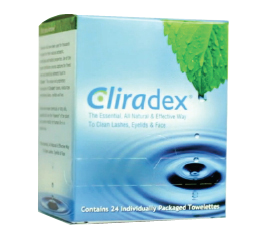 Cliradex™ is an eyelid cleanser made with tea tree oil. There are 24 individually wrapped towelettes in a box. With the hectic pace of modern life, it is very easy to miss out on the recommended amount of daily nutrition. Many people are not fimiliar with clinical nutrition. Physician Recommended Nutriceuticals (PRN) has recognized that clinical nutrition, or science-based nutritional education, has been lacking in our culture. In order to stay on the forefront of healthcare, PRN recently announced the launch of an online educational platform to target clinical nutrition called NutriUniversity™. This will be a dynamic and interactive learning community that is supportive of food-based medicine. NutriUniversity’s™ goal is to help physicians identify where nutrition can improve health, and to help patients build a foundation of the basics of nutrition and to help them understand how it links to their overall health. To visit and enroll in NutriUniversity,™ please go to www.NutriUniversity.org. For other nutritional facts and how nutrition relates to the eye, please read our blogs here. Please Bring Your Eye Medications With You! Due to pharmacists swapping brand medications to generics without contacting the physician, it is important for you to bring your current eye medications with you to every appointment. Often, generic medication cannot be used at the same frequency as name brand medication. Consequently, our physicians have noted that patients are being given incorrect dosing information of their prescribed medications. In order to prevent this from happening and ensure that our patients are getting the best results from their prescribed medications, please bring your current eye medications to every eye appointment. Our physicians and technicians will gladly review your medications and make sure that you are using them in the correct manner. In 2007, scientists were able to study the eyes of a preserved specimen of a colossal squid. They established that these were the largest eyes ever studied, and possibly the largest eyes of any creature on earth, current or extinct. The eyes of this specimen were a foot across, with a lens which was five inches across – an eye the size of a standard soccer ball! The scientists theorize that the eyes of a live specimen would be even slightly larger, as the freezing and defrosting process caused some tissues degradation or shrinkage. The structure of the eye mirrors that of other cephalopods such as octopuses in their camera-like abilities – the two part single lens (about the size of an orange) focuses images onto a retinal lining. These deep-sea creatures also enjoy enhanced visual acuity, detecting light at twice the depth of human vision thanks to light organs in the back of the eye, which act like a car’s headlights. What set them apart from other cephalopods and even other members of the squid family is that their eyes are set forward, instead of on the sides of their head, giving the colossal squid binocular or stereoscopic vision, allowing them to judge distance. The optic lobe (the part of the brain that processes visual stimuli) of the colossal squid is larger in scale than other squid specimens, indicating that they rely heavily on visual input. Their large eyes enhance their ability to perceive small details even at the pitch blackness 7,000 feet below the surface in the Southern Ocean where they live. The colossal eyes of the colossal squid certainly reinforce the diversity and complexity of the eye as an organ! The Physicians of Matossian Eye Associates proudly support the Eye Foundation of America’s goal to eliminate avoidable childhood blindness by providing eye care to remote areas. Priya Desai, MD, MBA will be presenting on cataracts and macular degeneration (AMD) at the Hopewell Valley Senior Center on September 16th at 10:30 a.m. Open to the public. Sebastian Lesniak, MD has become certified in the use the ReSure® Sealant. Cynthia Matossian, MD, FACS fielded a variety of questions from listeners during a recent webinar entitled "Inflammadry Q&A." The entire webinar can be viewed here, and an article summarizing the webinar can be viewed here. MEA's Lauren Brebner and Ivellisse Camacho of the Billing Department passed all the necessary exams to become Ophthalmic Coding Specialists. Congratulations to them! MEA's Kelly Gallagher of the front desk passed all the necessary exams to become a Certified Patient Service Specialist. Congratulations, Kelly! Cynthia Matossian, MD, FACS was honored to be invited to participate in a new quarterly consultancy called Insights Market Planning And Consulting Team (IMPACT). This forum for select physicians will allow them to discuss relevant topics. Cynthia Matossian, MD, FACS and Eric Donnenfeld, MD, FACS discussed study results looking at Keratometry readings in pre-surgical cataract patients. Dr. Matossian explained how testing her patients’ tear osmolarity helps her achieve the best possible cataract surgery outcomes. Please click here to view the video. Cynthia Matossian, MD, FACS spoke on the topic "Benefits of Omega-3s for a Healthy Ocular Surface" during a recent webinar. The entire webinar can be viewed here. A name and valid email address are required to view the video. ​​Cynthia Matossian, MD, FACS wrote the article, "Don't Set It and Forget It" in the September 2015 issue of Cataract and Refractive Surgery Today, please click here to read the article. Cynthia Matossian, MD, FACS wrote the article, "Dry Eye: Stay Ahead of this Curve ball," in the August 2015 issue of Ophthalmology Management, please click here to read the article. Cynthia Matossian, MD, FACS wrote the article, "Pearls from the Deep" in the August 2015 issue of Cataract & Refractive Surgery Today. Please click here to read the article. Cynthia Matossian, MD, FACS was asked to write an opinion on the article, "Vitrectomy to Treat Endophthalmitis After Cataract Surgery May Not Increase Visual Accuity" by Gower EW, et al. and published in Ophthalmology. Dr. Matossian's opinion was published in the August 2015 issue of Ocular Surgery News. Please click here to read the opinion. Cynthia Matossian, MD, FACS was interviewed for the article, "The Eye-Q Factor," on the cover of the August 2015 issue of VisionMonday, please click here to read the article.